Check out this Antioxidant Solutions Triple Cherry Blend 4 Pound bag at Costco. 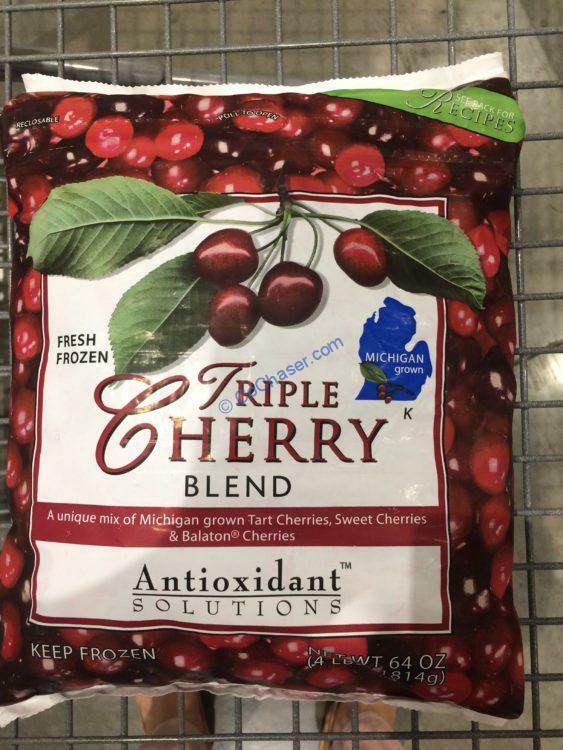 A unique mix of Michigan Grown Tart Cherries, Sweet Cherries & Balaton Cherries, is a fat free food and contains 2g dietary fiber and 8% of the reference daily intake of vitamin A and C per serving. This Triple Cherry Blend comes to you ready for snacking or to be used in your favorite recipe for family and friend s to enjoy. Keep Frozen! Additionally, cherries naturally contain antioxidants which help reduce harmful oxygen free radicals. Nutrition Facts: Per serving size 1 cup. (145g), it contains 70 calories, 2g fiber, 14g sugar. 8% vitamin C and 4% Iron.